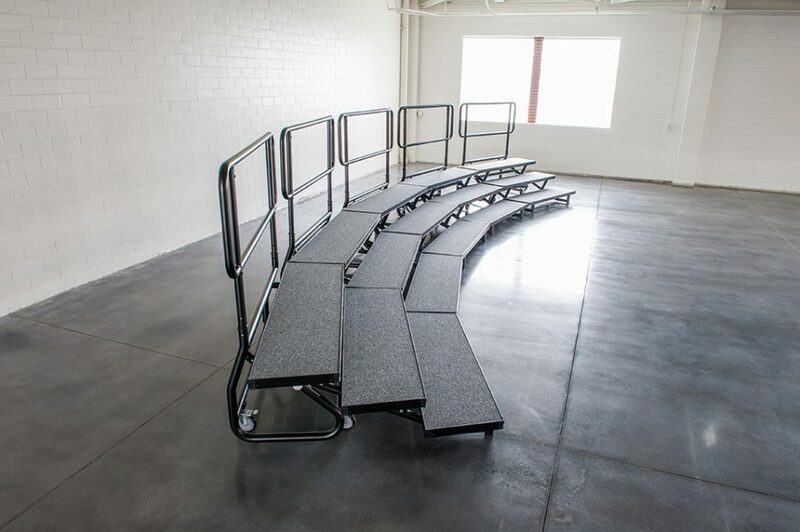 No other standing choir riser sets up as easily as the FR-36. 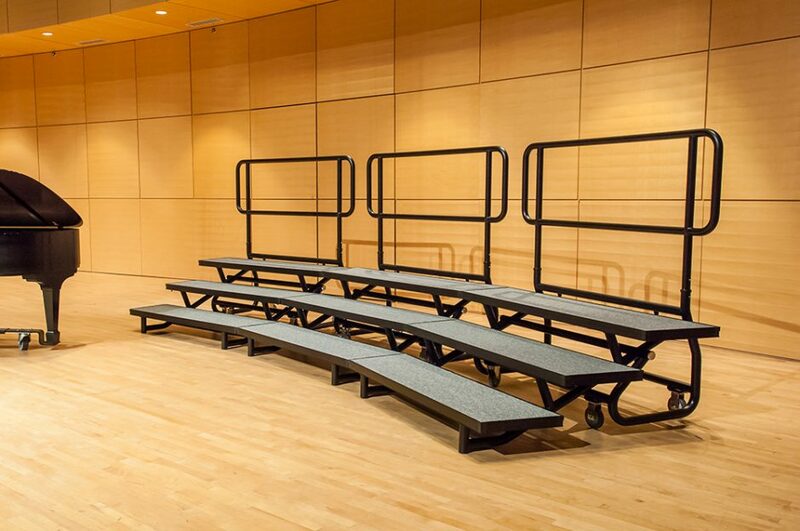 We have made the easiest standing choral riser to set up even easier. 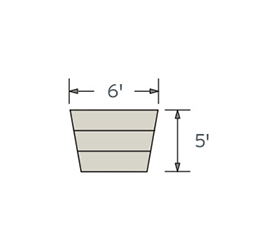 It has 3 levels with an optional 4th. 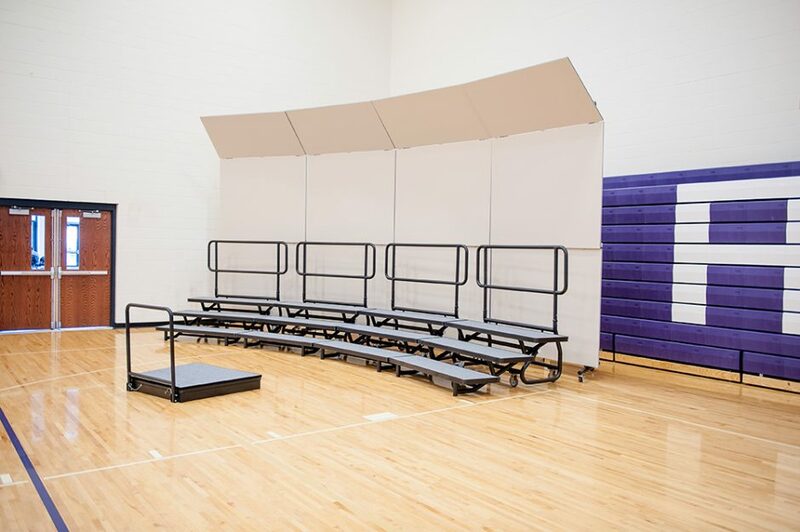 Simply roll it into place, unfold it, and the FR-36 Fold and Roll Standing Choral Riser is ready to help your performers look and sound their best. 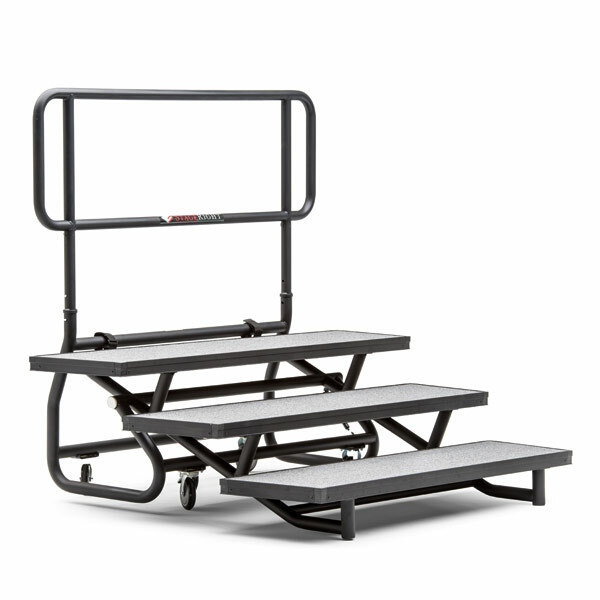 Locking casters assure your risers stay securely in place, while the self-locking assembly makes setup quick and easy. 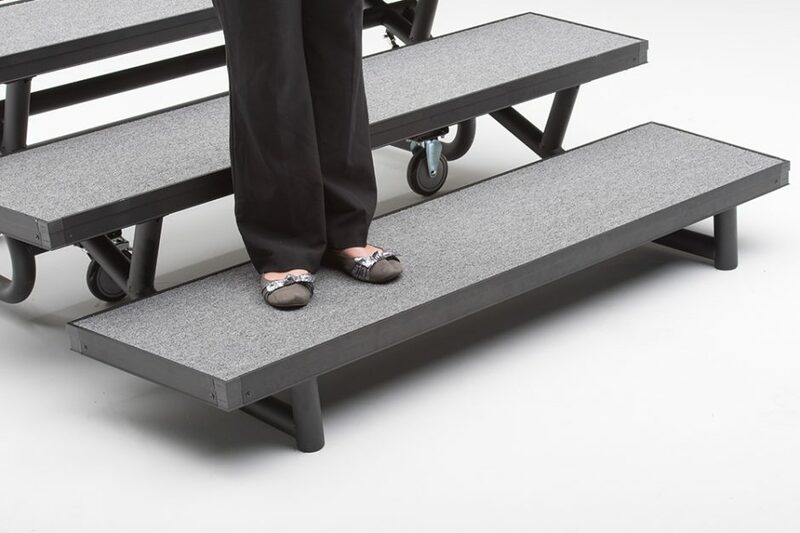 The new treads on the FR-36 Fold and Roll Standing Choral Riser have no sharp corners, and are substantially quieter, so distracting noises never become a part of your performance. 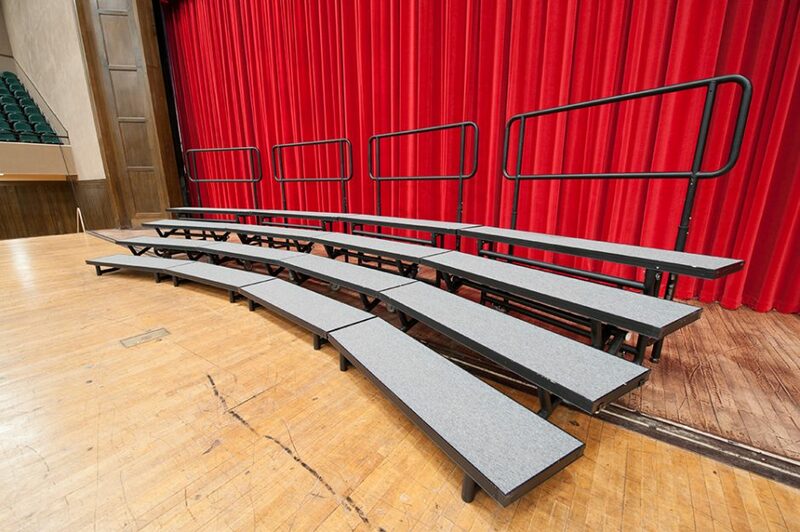 Anti-fray carpet means your risers stay looking newer, longer. 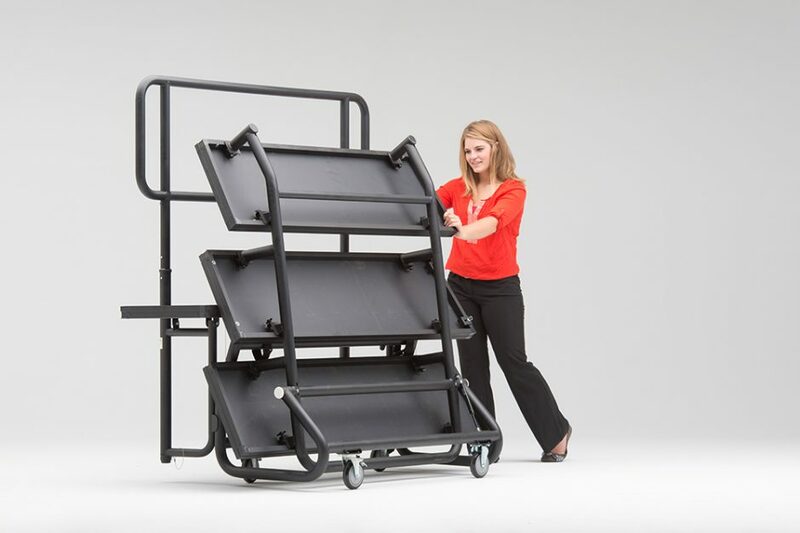 Save time—all parts are mounted to the frame (no tools, assembly or transport dollies are needed). 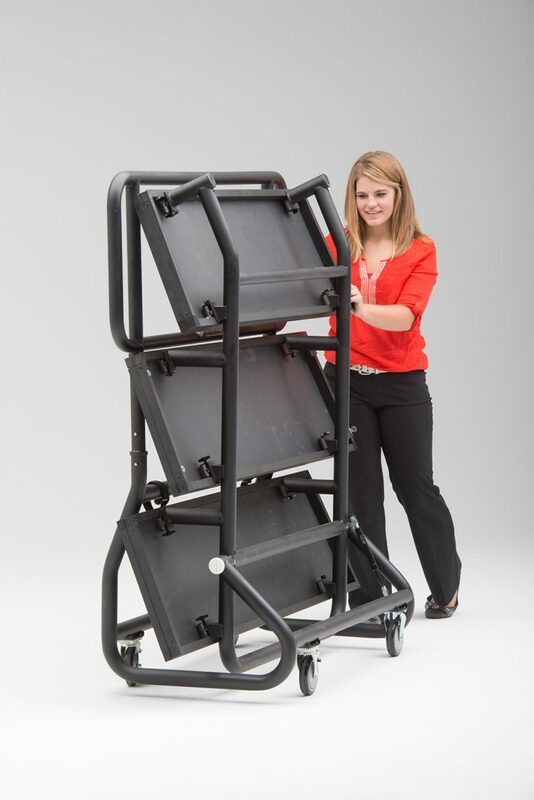 Reduce labor costs by using just one person to set up for your event. 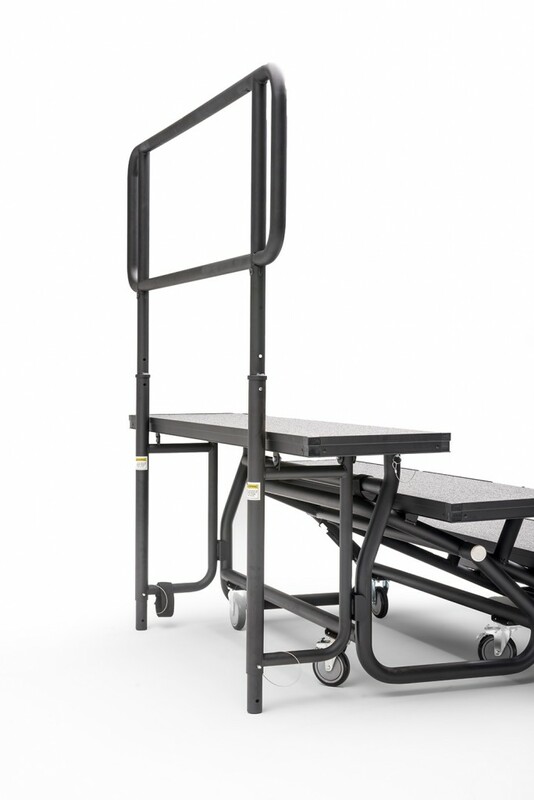 Use less effort as little weight is actually lifted during setup or teardown. 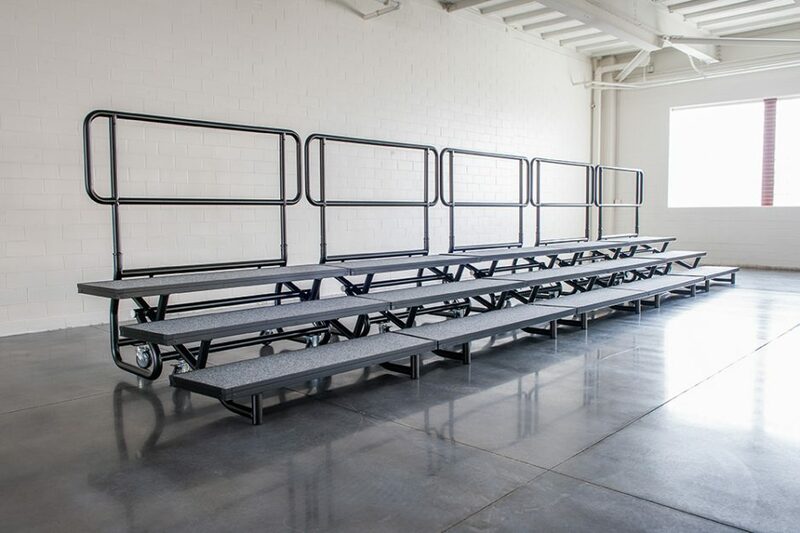 Free floor space for other events when the Riser is not in use. 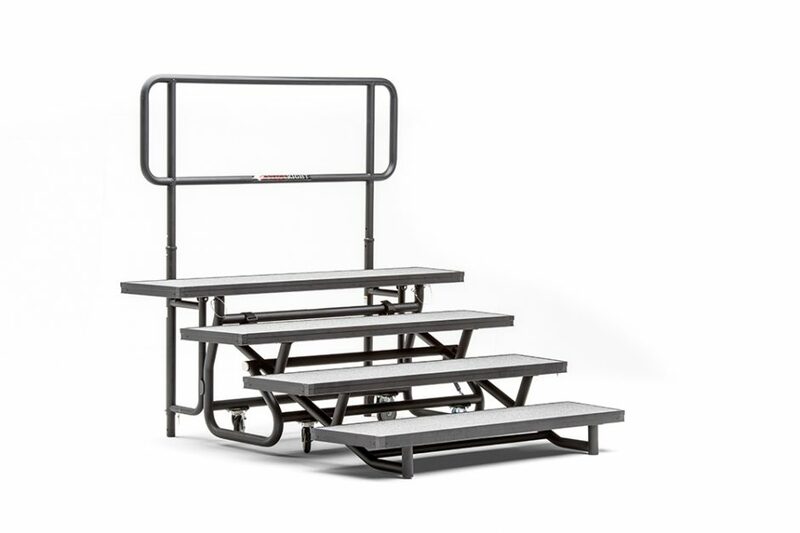 Safely roll Riser to-and-from storage thanks to the low center of gravity. Reduce the risk of back strain because the counterbalance aids in lifting. 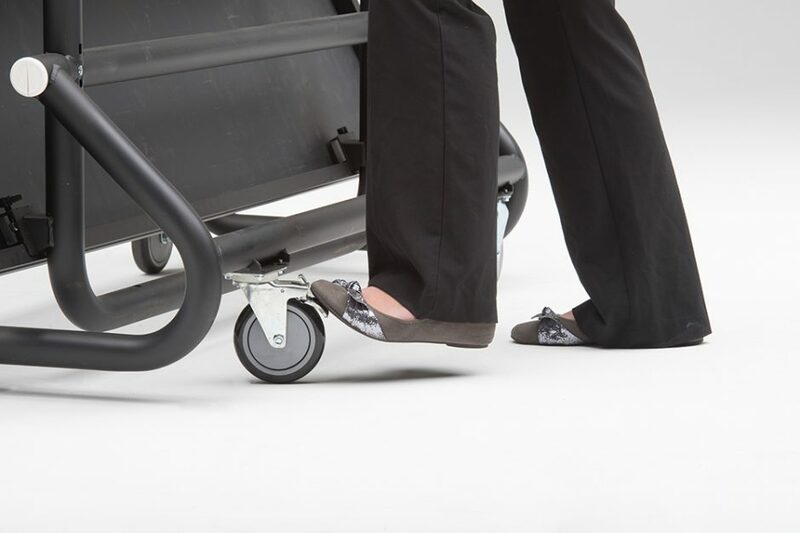 Save time and energy because tread stringer moves in one easy motion. 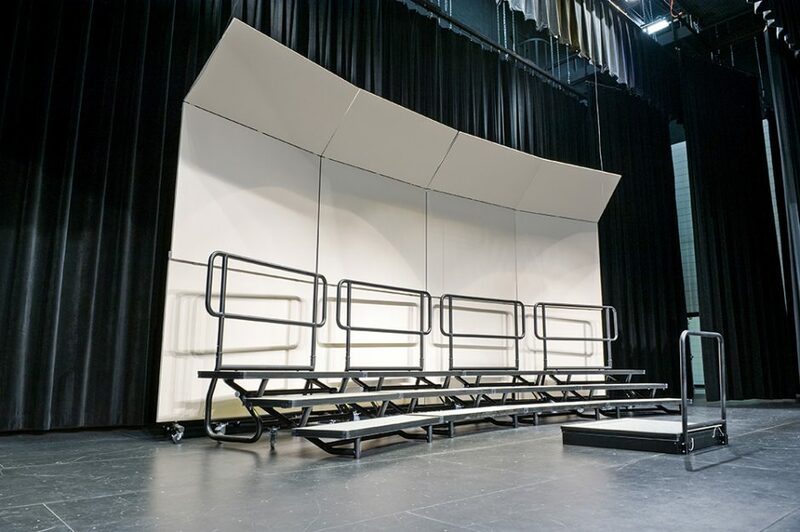 Choose either straight or semicircular configuration for your standing choir riser performance. 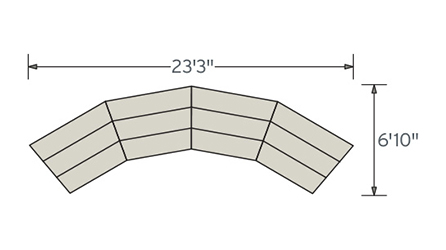 Save time—no tools required to release and reposition treads. 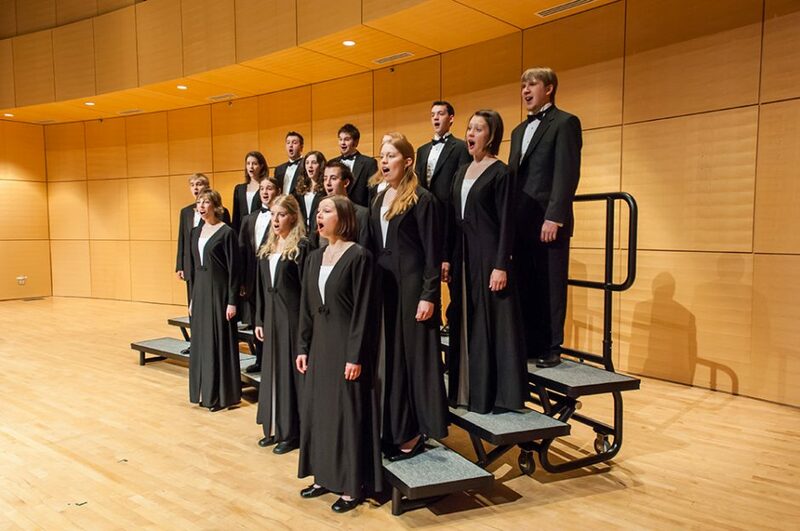 Sound better during the performance—carpeting muffles distracting foot noise. 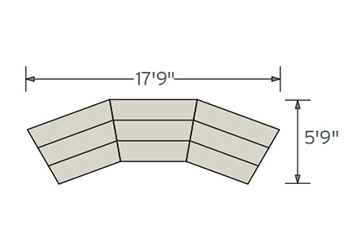 Save money on maintenance and replacement because the plywood, framed with extruded aluminum, lasts longer than the pressboard used in old-style risers. 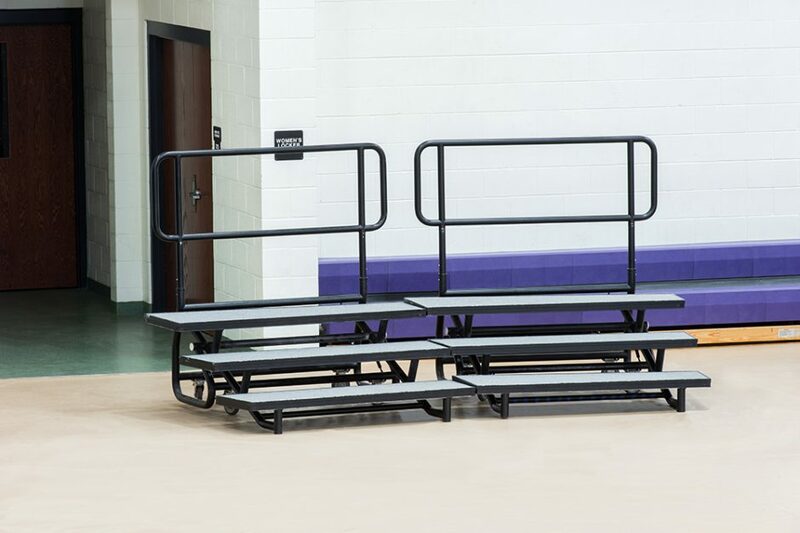 Give your performance a professional ambiance while you give performers a sense of safety and stability. 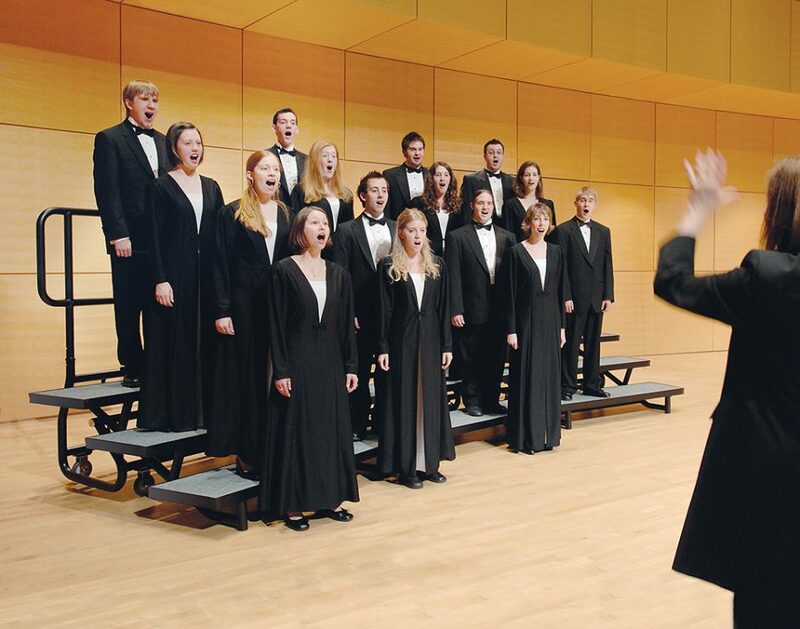 Improve your performance by eliminating distracting creaks. 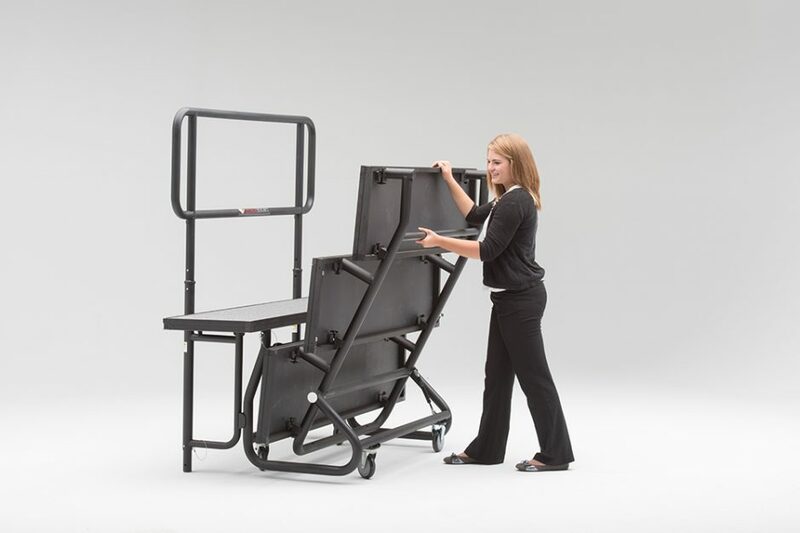 Perform more safely, protecting against accidental tumbles. 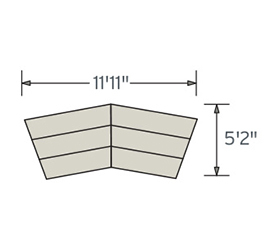 Metal-on-metal wear is eliminated, which saves you money by extending the time between replacement. 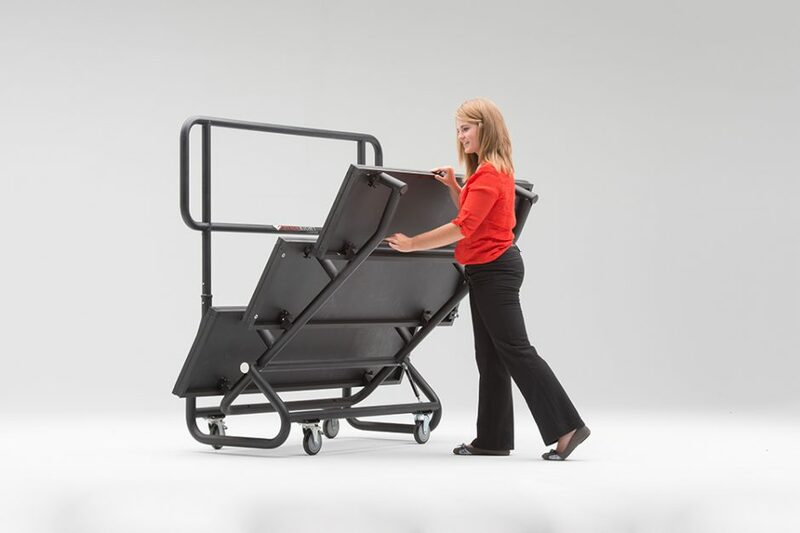 Reduce maintenance costs, as the folding mechanism does not need adjustments. Reduce labor effort because nylon is self-lubricating, providing smooth operation. 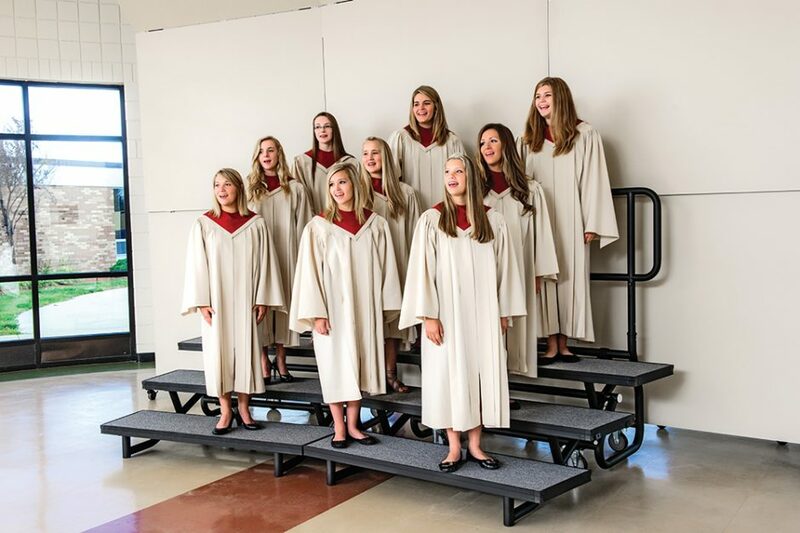 "Our music festival makes use of StageRight’s Z-800 seated orchestra risers, FR-36 Fold-and-Roll choral risers, and Alla Breve sound shells. 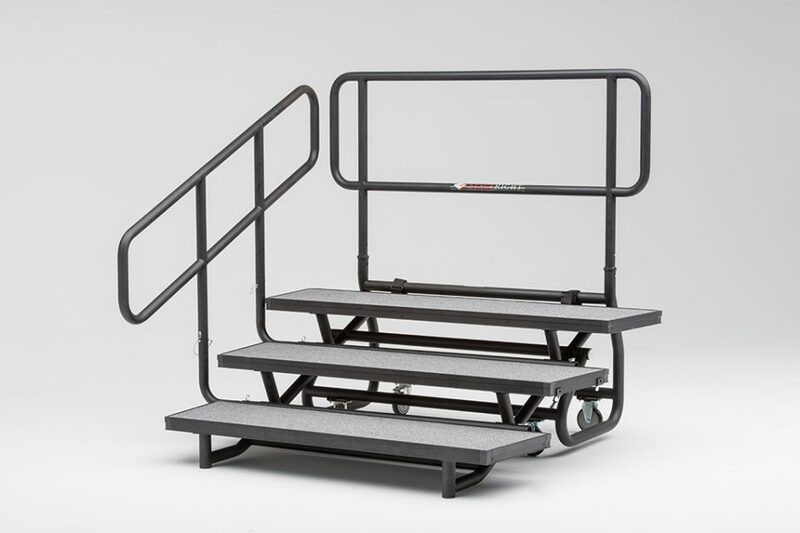 Based on my 30 years of performance experience, I can attest that the quality of all these items is without peer, solidly built to withstand heavy use and brilliantly engineered for ease of installation and removal. 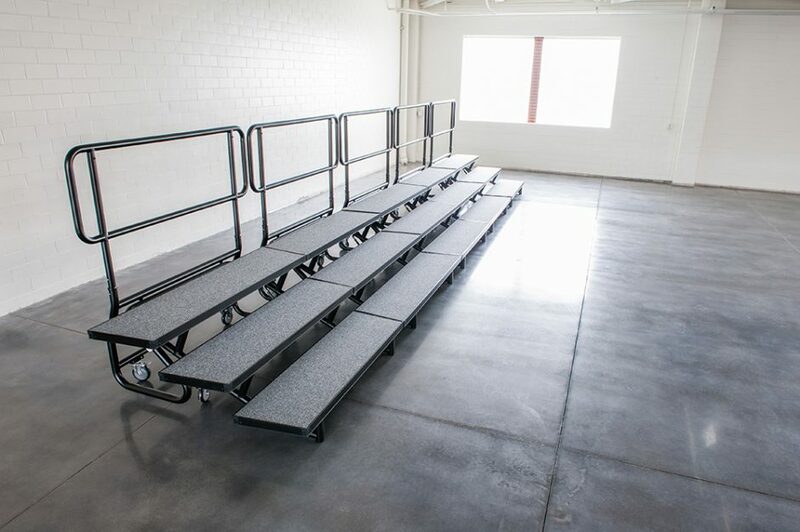 Thanks to Bill Teeter everyone at StageRight for your excellent products and customer service!" 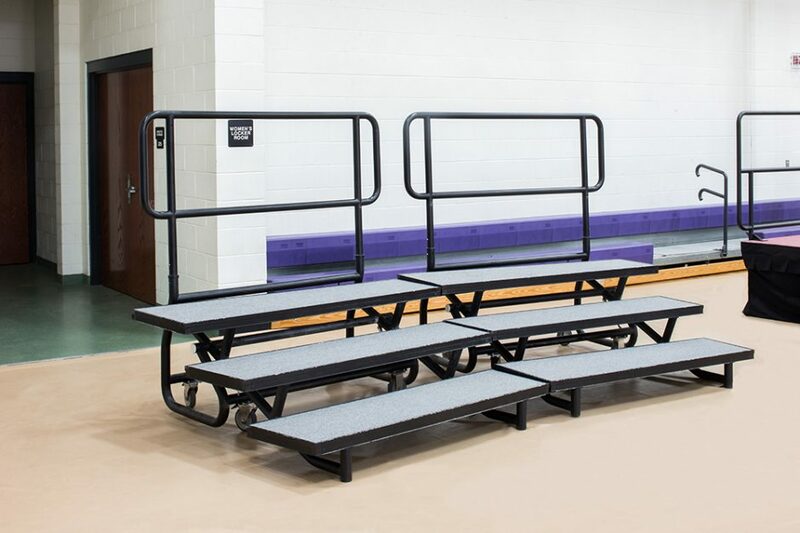 "Looked around for portable risers to use in my classroom (not the tri-fold ones I currently use when traveling), saw some sample risers at a convention and met Bill Teeter from StageRight. He was very informative and helpful in getting my order filled and delivered (pretty quick, too). 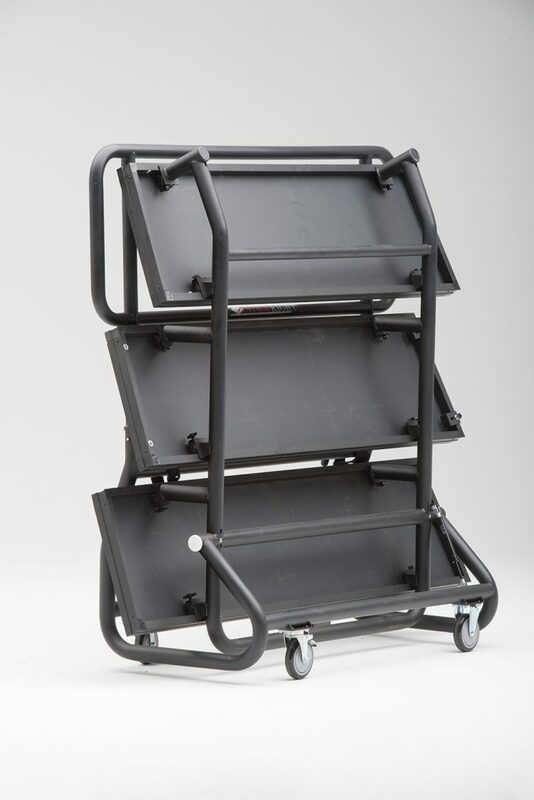 I ordered the fold and roll 3-level standing risers with a back rail for my classroom because of the way they were solidly built; strong enough to take the everyday wear-and-tear of high school students. They arrived ready to go and the kids and I couldn't be happier. Next purchase is the 4th step. 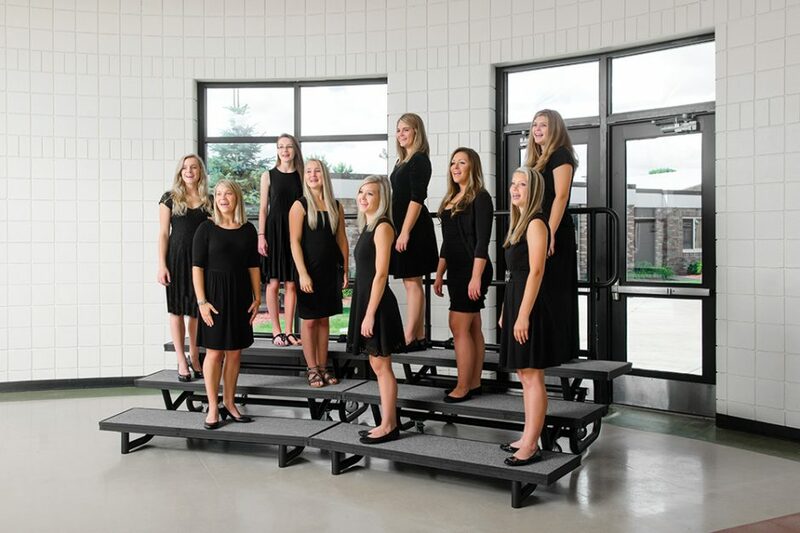 Excellent experience!!!!" "Kip was super communicative. 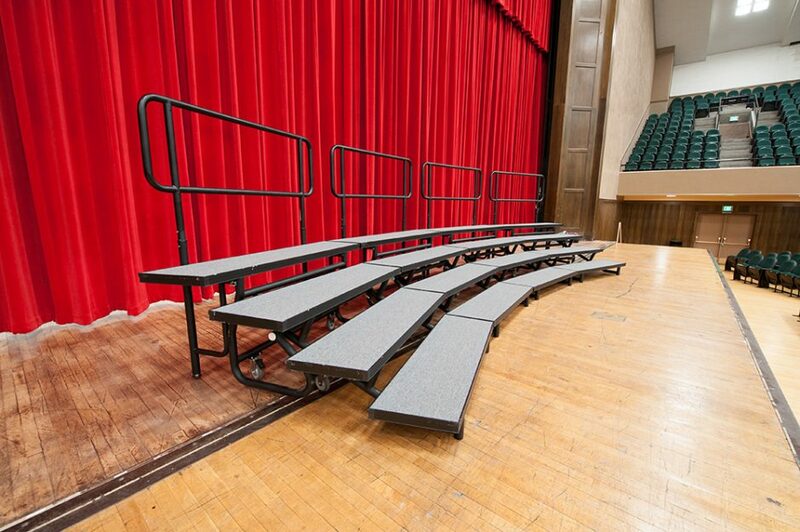 The risers are fantastic. Shipping was smooth. What more can you ask for?" 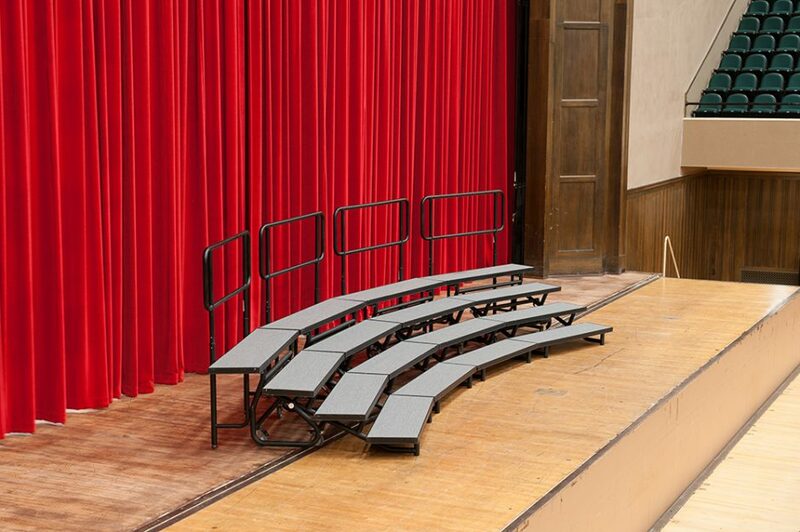 I had a wonderful experience with StageRight - my school ordered additional risers to add onto our current set of risers that were ordered over 12 years ago and are STILL in great condition. 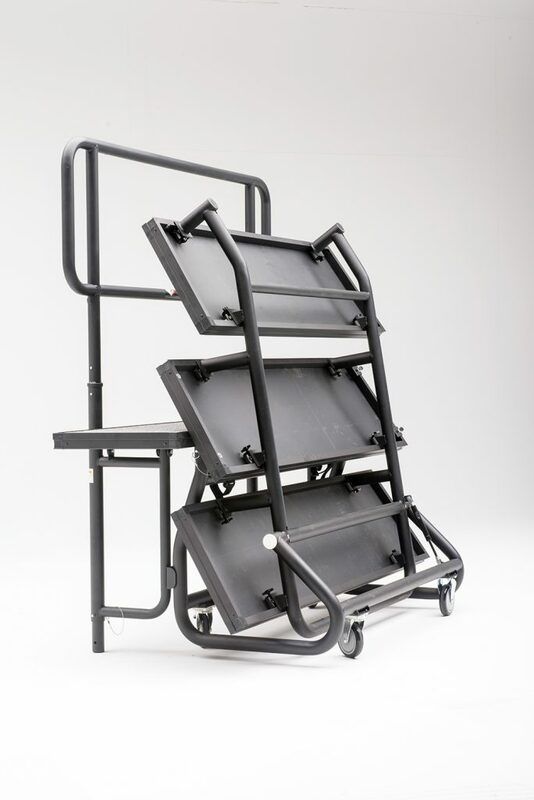 It is a wonderful product and we were so happy to work with StageRight again. Rick Roe was a huge help in looking up my school's previous order and getting me all kinds of quotes on different options for our school's needs. Thank you again, SR! 4th Level. 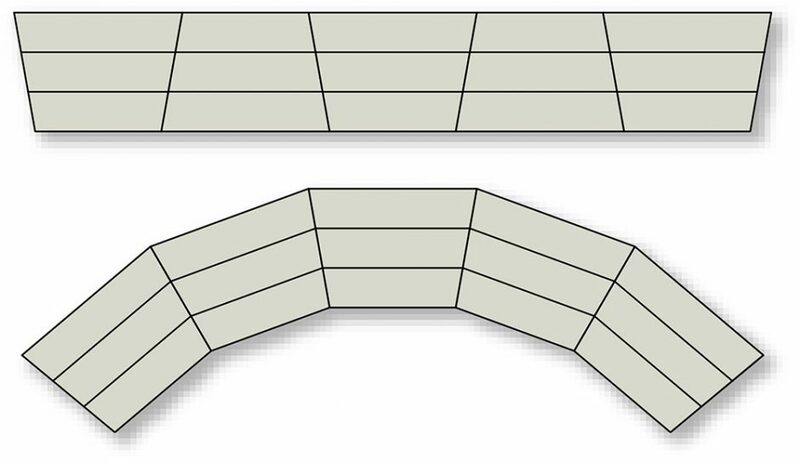 Optional Add-on that requires no tools for assembly.